When I first began hiking I would hit the trail with little more than the lint in my pockets and then find myself losing steam halfway through my hike. Afterall a hungry hiker is a cranky hiker! Needless to say, I soon realized the importance of bringing along some essentials, including snacks. The truth is you don’t need to be a long distance back-packer to bring food on your hike, even a day hiker needs sustenance! So I’ve put together a list of the five best snacks to take with you on the trail, not only to keep hunger at bay, but to help you stay energized. 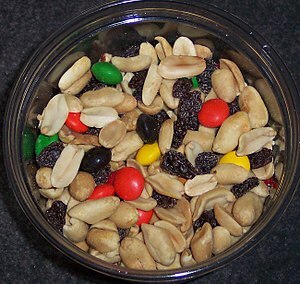 GORP: (Good Ol’ Raisins and Peanuts) Also known as trail mix, is far and away my favorite snack on the trail. GORP is tasty, economical and available anywhere, in a multitude of varieties and flavors. Whether you buy it or make it, in whatever flavor you prefer, with whatever ingredients you prefer GORP is as close to the the perfect food you’re going to find when you’re out on the trail. Snickers: “Snickers really satisfies!” is not just a product slogan, it is gospel out on the trail. The Snickers bar is the OG (Original Gangsta) of energy bars, and is far and away superior to all of the overpriced, over-hyped new age energy bars. They are cheaper, available everywhere and best of all… They don’t taste like sawdust! Hard Cheese & Crackers: Hard cheeses are one of my favorites out on the trail. Granted it takes a little preparation before hand, you’ll want to cut the cheese before you hit the trail (no pun intended); but the small amount of effort required is definitely worth the rewards. Nothing beats a few wedges of Asiago, Coverdale or cheddar cheese on a cracker halfway through a hike. Granola: Granola like GORP is tasty, economical and available anywhere, in a multitude of varieties and flavors. It is easy to find, easy to pack and tasty to eat! Beef Jerky: Beef jerky, real beef jerky is a fantastic trail snack. It’s tasty, lightweight and offers a great balance of fat, protein, and carbohydrates. It is readily available at most stores and keeps really well in a backpack or pocket. That’s my list, although far from comprehensive these snacks always seem to find their way into my pack. How about you? What trail snacks do you recommend? Do you have any favorites that didn’t make my list? Leave me a comment and let me know!